In 2005, whilst Warden of St. Pauls Trust in Liverpool, Rev Mike Keulemans had an idea for an award that recognised those seafarers who had made a significant contribution to the Merchant Navy and Fishing Fleets. The Trust had a history of providing basic training for youngsters hoping to join the Merchant Navy. The award was to become known as the “Merchant Navy Medal”. A small committee was established and set about raising support within the industries and establishing regulations. Three categories were agreed, and these were for those who: were serving, or had served at sea, regardless of rank or rating; non-seafarers who had made a significant contribution to safety, conditions or welfare of seafarers – these were to become honorarium awards; or had performed acts of courage afloat. Among the first two categories, a maximum of 20 medals could be awarded annually, of which five could be honorarium awards, whilst for “acts of courage” the numbers would be unlimited. The original Medal was rhodium-plated cupro-nickel and rounded in shape. On its obverse side was a profile portrait of Admiral Lord Nelson inscribed THE MERCHANT NAVY MEDAL around the top and 1805 TRAFALGAR 2005 at the bottom. The reverse face features the Merchant Navy logo with an inscription reading FOR MERITORIOUS SERVICE. The ribbon is red, white and green depicting the traditional colours of the merchant service. 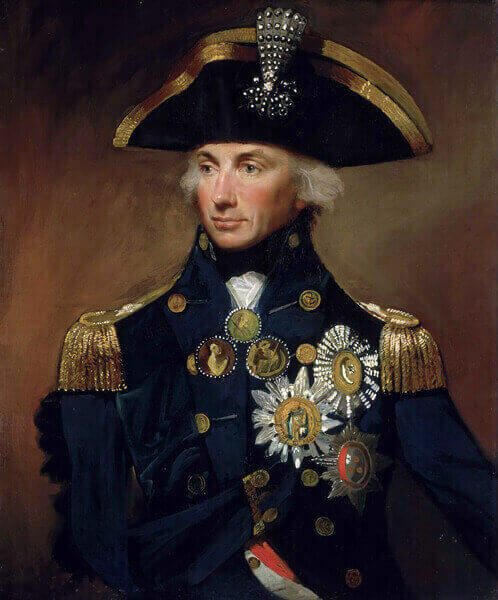 The reference to Lord Nelson was predicated on him being, arguably, the United Kingdom’s greatest seafarer. For this reason, the list of recipients was announced every year on Trafalgar Day, 21st October – a very significant date in the maritime calendar and the names published in the London Gazette. The original committee comprised of Rev Keulemans, Lord Lingfield, with wide expertise of such awards and who designed the medal, and Captain Matthew Easton, a Liverpool Pilot and one of the pilots who taught students of St. Pauls Trust. In 2005, there were nine recipients, one being for an act of courage afloat. The ceremony was held in the Ship and Mitre pub, Liverpool, in the presence of the Lord Mayor of Liverpool. In 2006 Admiral The Lord West of Spithead generously accepted the position of Patron of the Merchant Navy Medal and letters were written to numerous maritime organisations inviting them to attend a meeting in the House of Lords. It was obvious from this that there was a significant amount of support and the initiative quickly gained momentum. At the same time word began to spread amongst seafarers and shipping companies. In 2007 the Merchant Navy Welfare Board (MNWB) took on the administrative duties and their then CEO, Captain David Parsons, became the Secretary. Until then the categories of award had been carefully looked after by the Rev Keulemans with the Mission to Seafarers kindly providing the ceremony venue in the City over a number of years. Under the MNWB administration the Merchant Navy Honours Consultative Committee meet annually to provide the Department of Transport with advice and feedback on MN awards and honors. The ceremony was usually held in November. Trinity House very generously allowed the ceremony to take place in their historic City of London headquarters on Tower Hill. The Patron, Admiral The Lord West presented the medals, and all this did much to raise the profile of the medal. Member organisations contributed to the annual costs, including minting and inscribing the medals. Funds were greatly enhanced by two very generous charitable donations from the Sir Donald Gosling Foundation. 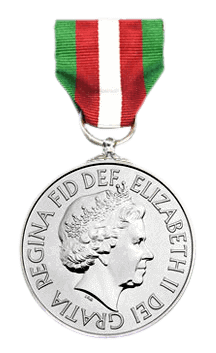 In 2010 a decision was taken to approach government to grant the medal an official order of wear, enabling it to be worn on the left breast, alongside other national honours or campaign medals. Sadly, the request was refused by government, who advised that for this to be granted, it would have to become a State Award which could only be granted by Her Majesty, The Queen. Thus, began five years of discussions with the Department for Transport, during which all areas from design of the medal and its ribbon, to the eligibility criteria had to be agreed. In 2015, Her Majesty, The Queen graciously signed the Royal Warrant for the new State Award - the “Merchant Navy Medal for Meritorious Service”. This can only be presented to those who have served at sea, importantly still in any capacity, in the Merchant Navy or Fishing Fleets. The normal eligibility criteria are for a minimum of 20 years’ service, some of which must be afloat and any remainder within the industry. The number of awards granted annually remains at a maximum of 20. Those without service at sea but have made an important contribution to the merchant service or fishing fleets can, of course, have their names submitted for other national Honours. The original committee now acts in advisory capacity to the Department of Transport, which welcomes the range of knowledge among its members. The names of the recipients are announced each year on Merchant Navy Day - 3rd September - and the medals are awarded on, or around that date, by HRH The Princess Royal in her capacity as Master of Trinity House. The ceremony continues to be kindly hosted and funded by Trinity House London.